Perry’s Victory and International Peace Memorial, located near Ohio’s South Bass Island, commemorates the Battle of Lake Erie, one of the most significant naval battles of the War of 1812. It also celebrates the lasting peace between Britain, Canada, and the United States that followed the war. It is the world’s largest Doric column, measuring 352 feet, and was constructed from 1912-1915. The remains of three American officers and three British officers lie beneath the stone floor of the monument. 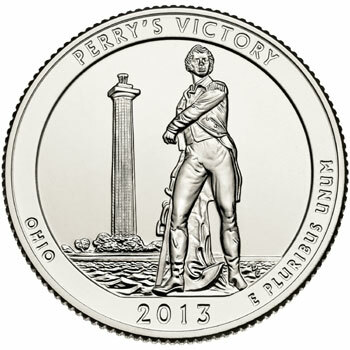 The Perry’s Victory Quarter depicts the statue of Master Commandant Oliver Hazard Perry with the Peace Memorial shown in the distance. Also included in the design are the incused phrases “Perry’s Victory”, “Ohio”, and “E Pluribus Unum”, as well as the date of issue. The coin will represent the second issue of the United States Mint’s America the Beautiful Quarters Program for 2013. 93 Delaware Avenue, Put-in-Bay, OH 43456. The evening before, a coin forum will be held from 5:30 to 6:30 PM at the Lake Erie Shores and Islands Welcome Center-West, 770 SE Catawba Road (State Route 53), Port Clinton, OH 43452. The design will also be released as part of the America the Beautiful Five Ounce Silver Uncirculated Coins.